William Peschel was in the Fire Service, and on the weekend of the Bath Blitz, he was based at the Bear Flat Fire Station at the back of the Wellsway Garage. Thes picture on the right (provided by William and taken in 1939) shows the NFS Sub-Station at the Bear Flat Garage. William Peschel is 3rd from the right. 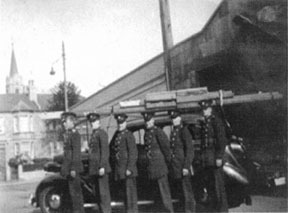 The car unit behind the fire-fighters is typical of the type used to help out in the Bristol Blitz. Earlier in the war he had been sent to other towns that had been blitzed such as Exeter, Plymouth and even Manchester. He did not realise then that he would soon be fighting the flames in the streets of his hometown of Bath. Along with the wardens, ambulance personnel, police and other emergency services, William and his fire crew worked almost continually throughout the three nights resting only briefly between raids. On the first night of the Bath Blitz when the alarm went off, our bells rang to send one unit to Bristol. But we realised when we got out of the station and were on our way, that Bath itself was getting it. We had to follow orders, so we went towards Bristol to the top of Brislington Hill which was the call-in place before you actually got into Bristol. When we got there we had an argument with the officer in charge. He said 'You'll have to stay here' and We said 'No, we're going back - the blitz is on Bath, not here. So we went back, but because of the bombing we couldn't get through to the station, so we had to go right the way around Claverton Down and come down North Road. In Brock Street there used to be an old chapel that had been turned into a furniture warehouse and that was burning and catching the houses around it and there was no water. Then they sent in other units from outside to help with the relay (of water) right from Victoria Park lake to Brock Street so we could save as many of the buildings as we could. When the Bear Flat went up on the second night, I was actually at home not far away. The fire station fortunately hadn't been hit and it was full of people who had gathered there for safety. Whoever had dropped their load of bombs, if they'd had one more, it would have been for the fire station. No one was safe not even those caring for the injured. 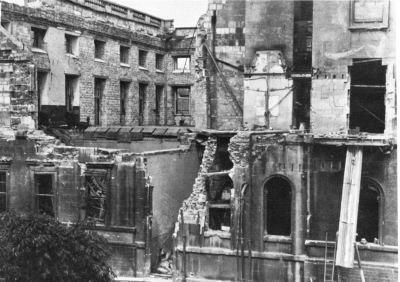 I remember that the bombs hit three hospitals - the Royal National Hospital for Rheumatic Diseases (pictured), the Ear, Nose and Throat Hospital in Marlborough Buildings and the Eye Infirmary in Lansdown Road. William couldn't remember the exact address of the headquarters. Other NFS records show that the headquarters of D Division moved to number 3 Royal Crescent on 17th November 1941. The fire control room was in the same building. The regional headquarters was either 3 or 5 the Royal Crescent. During the fires we'd use local people as messengers and they'd go between the different units. They could phone up the offices, but they couldn't contact the units out on fires, as we didn't have walkie-talkies then. So as soon as the officer-in-charge found anything that wasn't quite right, he'd send out a messenger down to the units. We dealt with the fires and the rescue squads dealt with the casualties. The wardens marked out the unexploded missiles and closed the roads off and they wouldn't allow anybody to go down. 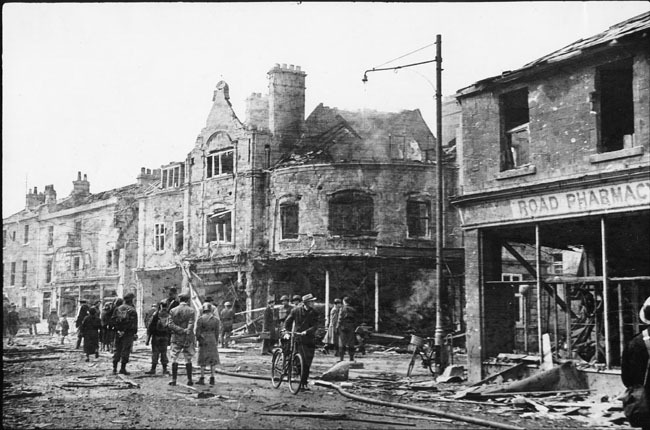 Even after the blitz was over William and his crew were kept busy for days, putting out the smouldering fires and pulling down the unsafe shells of buildings. This picture shows the remains of Bear Flat, with the fires still smouldering behind the people going about their business the next day. Note the hose lying in the road. The firemen were still working behind where the photographer stood. The Bear Flat Fire Station was a short way off the left hand edge of the picture.